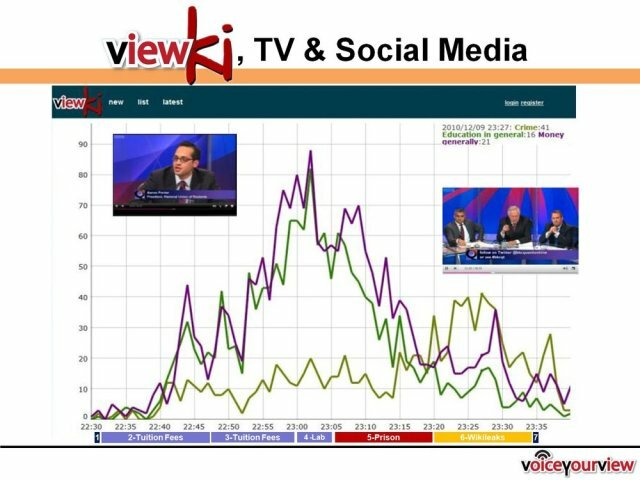 This is a VoiceYourView summary of the BBC programme Question Time aired 9th Dec 2010 22.30 to 23.30. Each tweet was auto tagged using our techniques and the top topics (by frequency) selected to plot over time. · We have automatically tagged the topic of conversation without doing any kind of special training or characterisation of systems to the dataset. We sit back and see what emerges. · This is a summary of approx 10,000 tweets generated in real time – something that would take many hours of researcher time to put together manually. · The content of tweets reflects the running order of the programme (see http://www.bbc.co.uk/programmes/b00wmz3q). The topic changes from student tuition fees (represented by the dark green “education” topic and purple “money” topic) to prison policy and then wikileaks (content of tweets shifted to “crime” – light green trace). See http://www.voiceyourview.com for more project information or follow @voiceyourview for the latest. © 2019 @willsimm. Powered by Wordpress & Simply Delicious.